Sri Lanka's long civil came to an end in 2009, the town of Puthukudiyiruppu was left with a grim legacy. Landmines and other unexploded devices lie behind every tree, in every ditch, in houses, churches and temples. Many were randomly scattered by Tamil Tiger rebels in the final months before their defeat. Both the rebels and the army made extensive use of Pakistani-made P4 mines, which can take the foot off someone unfortunate enough to step on them.
" 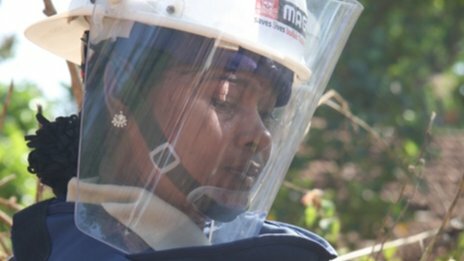 The women clearing Sri Lanka's mines" | Login or Create an Account | 493 comments The comments are owned by the poster. We aren't responsible for their content. Oggi, l'abilità tecnica Rolex Replica [kateurding.beepworld.it] del movimento rimane intatto, ma questa nuova esecuzione dell'orologio ha causato una Replica Rolex [www.raymondhart.onweb.it] ricerca di identificazione - ulteriormente - con l'auto in termini di materiali, colori e design. La Cabrio più veloce del mondo presenta un dipinto molto speciale, una lega moderna lucida e colore opaco che conferisce un aspetto quasi paramilitare all'auto. Significant thankies for the blog.Much thanks again.Im thankful for the blog.Much thanks again. Great.Very great article post.Really many thanks! May read on...Im happy for the post.Really looking towards study more. Great.I enjoy you sharing this blog.Really getting excited about study more. Want more.Thank you extremely for you blog article.Really thanks! Hold writing. https://www.kplokusa.com/	Awesome post.Really looking forward to read more. Want more. autoketing free	blogautoketing	facebook live chat	face book chat -This is truly decent to read..informative post is great to read..thanks a considerable measure! 릴게임 종류 Pretty nice post. I just stumbled upon your weblog and wanted to say that I have really enjoyed browsing your blog posts. After all I’ll be subscribing to your feed and I hope you write again soon! ice creamBakery In Hawaii [www.bakeryinhawaii.com] Pretty nice post. I just stumbled upon your weblog and wanted to say that I have really enjoyed browsing your blog posts. After all I’ll be subscribing to your feed and I hope you write again soon! BGP-15(66611-37-8) Pretty nice post. I just stumbled upon your weblog and wanted to say that I have really enjoyed browsing your blog posts. After all I’ll be subscribing to your feed and I hope you write again soon! Ganirelix powder Pretty nice post. I just stumbled upon your weblog and wanted to say that I have really enjoyed browsing your blog posts. After all I’ll be subscribing to your feed and I hope you write again soon! crypto news Pretty nice post. I just stumbled upon your weblog and wanted to say that I have really enjoyed browsing your blog posts. After all I’ll be subscribing to your feed and I hope you write again soon! Ipamorelin cost Pretty nice post. I just stumbled upon your weblog and wanted to say that I have really enjoyed browsing your blog posts. After all I’ll be subscribing to your feed and I hope you write again soon! Oral Turinabol powder Pretty nice post. I just stumbled upon your weblog and wanted to say that I have really enjoyed browsing your blog posts. After all I’ll be subscribing to your feed and I hope you write again soon! raw Synephrine powder Pretty nice post. I just stumbled upon your weblog and wanted to say that I have really enjoyed browsing your blog posts. After all I’ll be subscribing to your feed and I hope you write again soon! Testosterone decanoate powder Pretty nice post. I just stumbled upon your weblog and wanted to say that I have really enjoyed browsing your blog posts. After all I’ll be subscribing to your feed and I hope you write again soon! sarms/	How do SARMs work Attractive, post. I just stumbled upon your weblog and wanted to say that I have liked browsing your blog posts. After all, I will surely subscribe to your feed, and I hope you will write again soon! Lifeguard certificate [www.americanlifeguard.com] Attractive, post. I just stumbled upon your weblog and wanted to say that I have liked browsing your blog posts. After all, I will surely subscribe to your feed, and I hope you will write again soon!